Home Builders when building a new home or ground level extensions must include a termite barrier in accordance with Building Code & Ku-ring-gai Council requirements. In addition, home builders often find active termites during renovations when walls are remodelled or demolished. 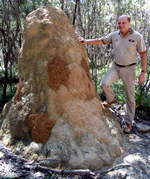 Glenn DuBois of FUMAPEST Termite Control Ku-ring-gai • article on destructive termites in the Kuring-gai Sydney Metro region - their identification - destructive nature - usual nest location sites. Glenn DuBois is Technical Director at FUMAPEST • Secretary of Australian Pest Control Association • Master of Commerce UNSW • TAFE Urban Pest Control Certificate • served on the NSW Govt Pest Licensing Board & Standards Australia Termite Control Committees AS.3660 & AS.4349. FUMAPEST Termite Control Ku-ring-gai has NSW Licence to install KORDON Termite Barrier in buildings during construction and advise builders and their clientele on what is required to properly protect the building from termites. Most homes are at high risk in the Kuring-gai Sydney Metro Region - particularly the medium to high density areas where well established gum trees are within a 100 metre radius of the building. The wide use of landscaping timbers and garden mulch also dramatically increases the risk. Many of the older style homes, built low to the ground, with poor ventilation, are ripe for subterranean termite attack and should be protected by Termite Preventive Barrier to AS.3660 using Termidor soil treatment termiticide. PROPER IDENTIFICATION IS ESSENTIAL • Some species of subterranean termites prefer to attack living trees and will not eat dry seasoned timbers in a building, whilst others can be are highly destructive to such buildings in a short amount of time. Coptotermes acinaciformis - common in Kuring-gai Sydney Metro Region particularly in built-up urban areas - under concrete on-ground flooring - areas where eucalypt gum trees are prevalent. Highly Destructive - most widely distributed and destructive timber pest in the region - accounts for more than 70% of damage to buildings - a single colony may contain more than 1 million termites. Nest Location - Coptotermes acinaciformis - very secretive termite species - build their nest out of sight, often within the base of eucalyptus or other susceptible trees, or completely under the ground - often within an enclosed patio or under concrete on ground flooring which is ideal for moisture retention, temperature and humidity control within the termite colony's central nest. Schedorhinotermes intermedius - often found in Kuring-gai Sydney Metro Region - they appear to gouge affected timber - soldiers contain a larger major 6mm length - minor soldier 4mm length. Nest Location - Schedorhinotermes intermedius commonly build their nest in tree stumps, in the root crown of living, dead or debilitated trees, under houses or within enclosed patios or other areas where timber is buried or stored in contact with the soil. Coptotermes frenchi - are found in the Kuring-gai Sydney Metro Region - particularly in built-up urban areas, where homes and buildings are constructed of softwood or oregon timber framing. Highly Destructive - causing severe damage to buildings and other wooden structures - often devouring timber framing leaving behind only a hollowed out thin veneer. Nest Location - Identification - they often build their nest in root crown or lower trunk area of living trees, particularly eucalypts - may build their nest as a mound in dryer areas - Coptotermes frenchi is an extremely shy termite - they will retreat from a location immediately, if disturbed.- the soldiers have a pear shaped head compared to a somewhat rectangular head of Coptotermes acinaciformis. Nasutitermes exitiosus are commonly found in the Kuring-gai Sydney Metro Region and other areas of NSW - particularly in built-up urban areas or where eucalypt gum trees are highly prevalent. Coptotermes lacteus are found in the Kuring-gai Sydney Metro Region and accross eastern NSW - particularly prevalent along the entire coast-line, along the Great Dividing Range and western slopes. Nasutitermes walkeri are commonly found in the Kuring-gai Sydney Metro Region and other coastal and mountain regions along the eastern side of NSW. Nasutitermes walkeri can be destructive to damp timbers often a serious problem where the sub-floor of a building is damp and ventilation is poor with resulting wood decay or fungal growth. Heterotermes ferox are commonly found in the Kuring-gai Sydney Metro Region particularly where eucalypt gum trees and damp decaying timber are highly prevalent. Prefers Damp Decaying Timbers - usually encountered attacking posts, poles, paling fences, timber decking and flooring - wherever weathering and decay are present - sometimes may cause severe damage to sound timbers - often confused with the more destructive Coptotermes acinaciformis. Nest Location & Identification - a multi-nester - small subterranean nests - near stumps, rotting wood or nests of other species - do not range far from nest - do not have extensive gallery systems - leave affected timber with mottled appearance - soldiers 3.5 to 7.5mm - with a long rectangular head - no obvious teeth on dark mandibles - display a peculiar shuffle backwards when confronted. Drywood Termites occur mostly in tropical areas, where atmospheric humidity is constantly above 75 percent. The introduced and highly destructive West Indian drywood termite, Cryptotermes brevis, is rarely located in NSW, once in Sydney in the early 1980's. Specialist eradication procedures involve wrapping entire building in plastic and using methyl bromide fumigation. Same Family Business Since 1964 • FUMAPEST Termite & Pest Control is a second generation family business. After more than 50 years of providing pest control in Ku-ring-gai Council Region, we have a valuable reputation to protect and a wealth of knowledge and experience, unmatched by our competitors. APCA Consumer Advisor • FUMAPEST Termite & Pest Control is a major sponsor of the Australian Pest Control Association; regularly assisting APCA Secretariat in providing professional advice to consumers with pest control problems; pesticide safety issues; and pest control training courses in NSW.